Edge of Tomorrow is film that I went into not expecting much and came out pleasantly surprised with how good and well done the film actually is. The film follows ‘Cage’ played by Tom Cruise and ‘Rita’ played by Emily Blunt. Tom Cruise’s character is able to travel back in time to a certain point after every time he dies and can then alter what he has already done, this causes him to form a bond with Emily Blunts character who helps him train and subsequently from this move forward in the hopes of defeating the alien threat that is ravaging the planet. Though what more or less is a simple plot the film is actually much smarter in the way it presents things, especially the ground hog like scenario of Tom Cruise’s character continually returning to the same point in time after he dies. This idea explores the interesting themes of death and what it may do to someone who has to constantly live through it and keep on going. It also explores loss and with Tom Cruise’s character having to experience death over and over again he also has to keep experiencing the deaths of the people around him he cares for most, Emily Blunts character in particular. These theme help add a significant amount of weight to the film and help in adding another layer to what could have just been a dumb kill the aliens film. Giving this film some heart really helped elevate it. What also helps keep you interested in the film is the pacing. The film never once lets up on it, jumping from life to death to reincarnation in short quick scenes and then focusing on poignant thought out scenes of dialogue and emotion. The film keeps a pace that never once makes you wish they would hurry along to the next action scene because everything you are watching feels necessary to the furthering of the film. The film does of course falter in places one of which is characters. Apart from the well-acted roles of Tom Cruise (Who I know isn’t everyone’s cup of tea but in this film is particularly good) and Emily Blunt. The rest of the cast is forgettable and at times cringe worthy. With lines that are delivered poorly or with a cheesy factor it can make you wince, the supporting cast of this film just isn’t up to par with the lead characters which is a shame, I feel if these characters where perhaps more fleshed out and the acting for some had been more solid then there would have been a more consistent and truer feeling to the film. The film is also let down by the final 20 to 25 minutes. Edge of Tomorrow has a really interesting plot that for its Sci-fi nature keeps an interesting concept running through out, however near the end of the film this seems to be replaced by an obvious, sometimes frustrating Hollywood ending where certain pieces fall conveniently into place and knowing that this is a big summer blockbuster film you know that ending isn’t going to stray away from anything that is too different or risky from what you’re used to seeing. This fact did take away from the film but still doesn’t ruin it. I do however wish to return to the themes the film explores, those being death and living after you should very much be gone from the world. This idea has been approached in many different films and books making this a topic that isn’t unique but that fact still doesn’t detract from this film and is in turn its most redeeming quality. The way in which director ‘Doug Liman’ and writers ‘Christopher McQuarrie’ and Jez Butterworth’ approach it is so apt for the war time scenario. Having to continually wake up after dying horrifically on the battlefield and keep on going with your intended mission is brought across so well on screen (helped by Tom Cruise’s portrayal of this difficult scenario) you do get the sense of just how arduous and challenging such a task is and how the film is edited and presented for these moments is also a plus point for its presentation of these. This concept with in the film was certainly the most enjoyable to explore and then ponder long after I had seen and finished with the film. Edge of Tomorrow is a film that like I said at the beginning of this review was not something I was expecting great things from. 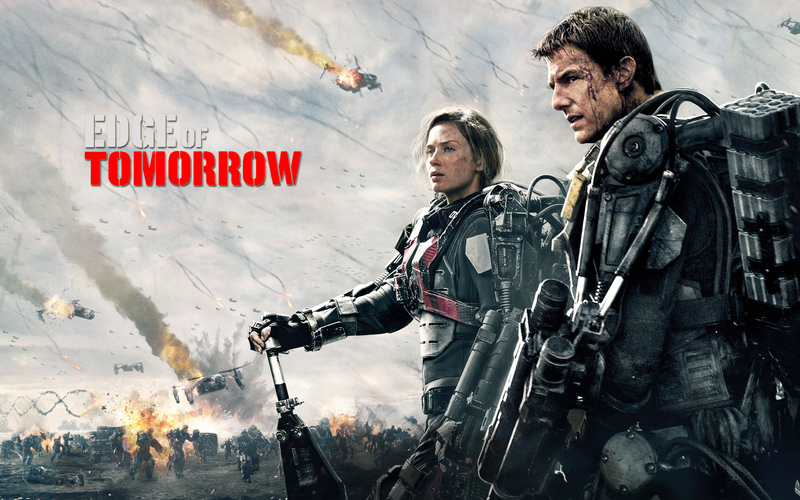 I’m glad to say that isn’t the case, I left Edge of Tomorrow really happy with what I had seen, the film has a really interesting plot that though has few hiccups in its delivery is still great, it has a cast that is slightly weak but is still held together well by its leading duo, visually it’s nothing special but from an action stand point is well done and enjoyable to watch and overall the film just works. It’s fun, enjoyable and worth seeing if you have the afternoon free with your friends.